Last week I noticed Black Rice had appeared at my Ralphs Market for the first time and was totally intrigued, so I bought some. This Black Rice Salad was a great recipe to try it in and a perfect chance for me to use some of the green onions I have been growing on my kitchen counter. This science experiment with the green onions I read about on ShockinglyDelicious. Dorothy said just cut the onions off about 4 inches above the roots, place in a glass of water and wait for the roots to grow and new onion shoots to grow out the top. This sounded like fun, so I did as she said and, lo and behold, I have ever-growing green onions. Which must be harvested and used up. Like in this salad. The onions that grow are perfect, with no bug damage or imperfections like those you get at the market. And they grow really fast. It seems like overnight they grow inches. It will be interesting to see how long they can keep it up. And how many recipes you’ll be reading on my blog that have green onions in them. lol. 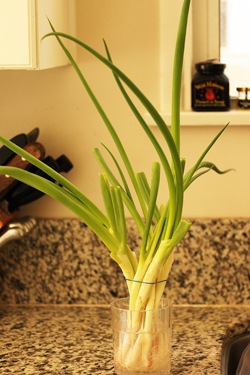 The second science experiment on my kitchen counter is lemongrass, which is also growing roots, prior to being planted in a container outside. I have been very disappointed with the lemongrass I have bought at various markets. Usually it is dry, brown and totally tasteless and consequently the dish it is used in will be lacking its lemony-ness. I read somewhere you could get it to root in water. 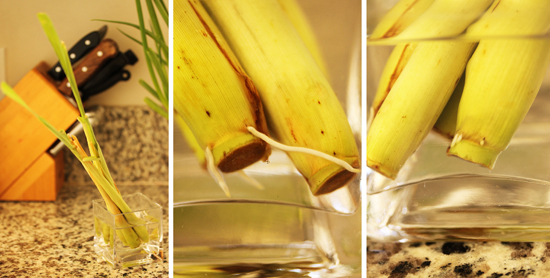 I found some stalks that seemed to have some life in them, put them in water and waited. And waited. I was going to throw them out as a failed experiment, and then one tiny little white bud appeared. I was jumping up and down like Rocky! Yes!! They will go in a container, not in the ground, as I understand they have a tendency to take over your yard. The running joke about lemongrass is: How do you get rid of lemongrass? You move to a new house. Anyway, I will be reporting on how this works out. Lemongrass and its new roots! There is no lemongrass is this Black Rice Salad, however, now that I’m thinking about it, there is lemon zest and lemon juice in the vinaigrette. So maybe next time I make this salad I will bruise and mince up some lemongrass and add it in. Hey, isn’t this how new recipes are born? 1. Cook rice according to package directions. Drain in colander and run cold water over rice to cool. Shake out as much water as possible and pour rice onto sheet pan to dry. 2. Heat olive oil in large non-stick pan. Add butter nut squash cubes and cook over medium low heat until starting to brown. Stir, cover and cook until squash is soft. Remove to plate to cool. 3. Place all vinaigrette ingredients in medium bowl and whisk to emulsify. 4. 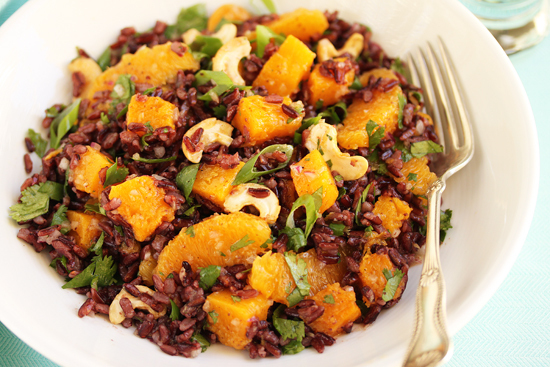 In a large bowl, place rice, squash, orange segments, cilantro, red onion and cashews. Toss to combine. Pour vinaigrette over and toss to coat. Adjust salt. Garnish with green onion slices. Wait… so you can forever grow green onions? Supermarket ones, and trim them, and keep trimming off the green part for food? WHY DID I NOT KNOW THIS? So trying this next time I buy green onions! Wow, the colors really pop against the black! Is that black Japonica rice? I LOVE black rice! I bought a ton when it was on sale and ate a bunch of it – in fact I was really suprised my three year old daughter loves it. 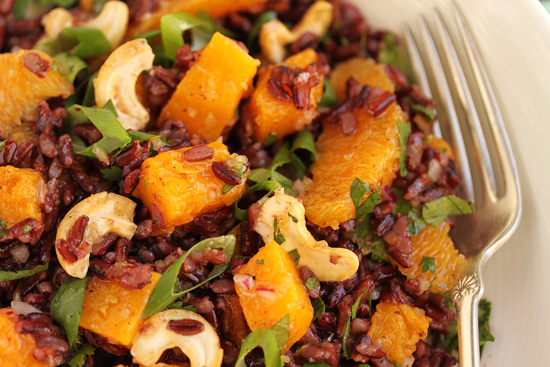 The rice with the butternut squash is a fantastic idea.